January 29 - Joseph Smith nominated as a candidate for President of the United States by a political convention in Nauvoo. Last meetings for the Female Relief Society held in Nauvoo. April 30 - Addison Pratt starts mission in Tubuai, the first missionary in the South Pacific. May 7 - Press for the Nauvoo Expositor arrived. May 11 - Council of Fifty organized. June 7 - William Law publishes the first and only edition of the Nauvoo Expositor. June 11 - Joseph Smith and the Nauvoo city council charged with riot in the destruction of the Nauvoo Expositor press. June 22 - Joseph Smith and Hyrum Smith surrender themselves to Governor Thomas Ford to answer charges laid against them. 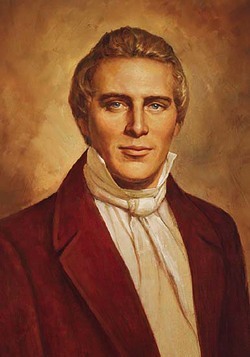 June 27 - At Nauvoo, Illinois, Elder John Taylor writes a eulogy announcing the martyrdom of Joseph Smith which is later cannonized as D&C 135. June 28 - The bodies of Joseph Smith and Hyrum Smith are placed into two separate wagons and taken to Nauvoo by Willard Richards, Samuel Smith and Artois Hamilton. August 8 - Sidney Rigdon's request to be appointed guardian of the Church was rejected by a special conference, and Brigham Young was sustained in his assertion that leadership should fall to the Quorum of the Twelve Apostles. June 27 - Joseph Smith is murdered in Carthage Jail. June 27 - Hyrum Smith is murdered in Carthage Jail. This page was last edited on 5 August 2017, at 11:55.